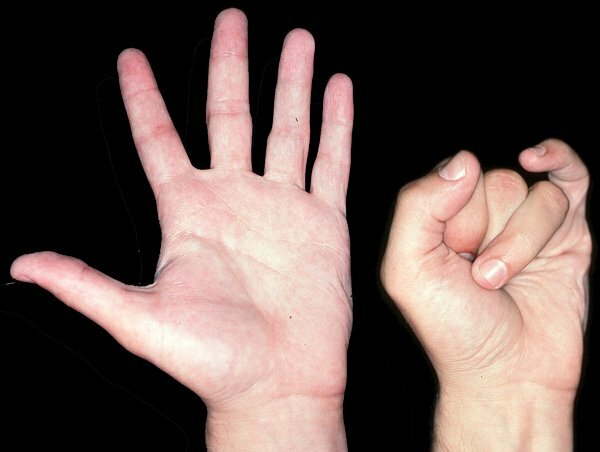 Here are some facts you may not know about your hands. With 34 muscles, 27 bones, 48 named nerves and at least 123 ligaments in each hand, the human hand is known for its ability to carry the entire weight of a human body on just a few finger tips. Furthermore, about a quarter of the motor cortex in the human brain is devoted to controlling hand muscles alone. Yet despite the ability to handle all kinds of complex tasks, there are actually no muscles in your fingers — they are all controlled by the muscles and tendons located inside the palm and forearm. In comparison to other primates, human hands are much more nimble and mobile. They have evolved from that of primates’ into a unique shape with longer thumbs and flexible fingers that can master the grasping and manipulation of tools. On the other hand, our primate relatives have maintained the long palms and short thumbs that are more suitable for climbing and knuckle-walking. With an opposable thumb, humans are able to grip, grasp and extend the hands in a precise way that allows us to write, type, play the piano and manipulate many other complex instruments. Without the unique anatomy and construction of the human hand, many of the instruments that we play today may not exist in the way we currently know them. While other primates also have opposable thumbs, only human thumbs can easily touch the other four fingers. Therefore, although other primates’ hands have a stronger hooking function, they cannot grip items as tightly as human hands. It is thus harder for other primates to make good use of tools. For example, most gorillas can use one hand to put food in their mouths. However, as soon as the fruit has been bitten, the other hand is needed to balance the food in the mouth. Unlike the apes however, human arms have become relatively weaker in comparison to our legs, and our feet cannot effectively manipulate objects since our big toe has moved up in line with the others. Nevertheless, it is hard to imagine where mankind will be today without these incredible human hands. Originally, the famous German composer Robert Schumann (8 June 1810 – 29 July 1856) was set to become a lawyer under his mother’s influence. However, he soon quit law school in order to pursue his much preferred career as a virtuoso pianist. Under the guidance of Friedrich Wieck, Schumann told his mother that he would become a pianist better than anyone else. Unfortunately, a growing pain in his right hand soon imposed physical limitations on his piano playing, putting an end to his dream. As he played, his fingers would harden, and the painful sensation would slowly encroach to his arms. Schumann’s complaints of various hand ailments were recorded in his diary entries starting in the spring of 1831. By May 1832, he writes that his third finger ‘seemed really irreparable’. By June 1832, his third finger had become completely stiff, causing him to question his future as a concert pianist. It was revealed that upon learning about his condition, Schumann had turned to a device called “Cigar Mechanics”, where a sling attached to the piano would pull his middle finger upwards and hold it there, while the other fingers remained moveable on the keyboard. Unfortunately, the device was of little help and his career as a pianist soon ended. Many have speculated about the true cause of Schumann’s hand ailments. Some say he hurt his finger using a special mechanical device to enhance his finger-technique on the piano, while others say that it was a result of the many diseases that he suffered from, including depression, insomnia, manic depressive schizophrenia, and most importantly, syphilis. In those days, the solution to syphilis was the inhalation of mercury fumes, which we now know would lead to all kinds of neurological problems. According to Eckart Altenmuller, Robert Schumann suffered from a task-specific focal dystonia, commonly known as the musician’s cramp. This is a neurological disorder characterized by the loss of fine motor control during instrumental-playing. On average, one out of every hundred musicians in Germany possesses this condition, and men are shown to be affected six times more frequently than women. Although Schumann’s hand problem sadly ended his career as a concert pianist, he may never have otherwise become the accomplished composer that we know him as today. Many people would also feel sorry for Lee Hee-Ah, a Korean woman who was born with only two fingers on each hand and no legs below her knee caps. Her condition is believed to be caused by motion-sickness pills ingested by her mother to deal with carsickness before she realized she was pregnant. When Hee-Ah was born, many tried to persuade her mother to give her up for adoption, but her mother refused. What then began as training exercises on the piano for her weak fingers at the age of seven, then paved the way for the successful “four-fingered concert pianist” she is today. In 1992, Hee-Ah attained First Prize at the Korean National Student Music Contest. She has since gone on to win many competitions, and has even released her own album. She has also performed in many countries such as China, Japan, United States, Canada and Brazil, amongst others. Her repertoire consists of complicated pieces difficult even for ‘normal’ people, spanning Chopin, Beethoven to Liszt. Hee-Ah’s story is an affirmation that even with disabilities, the human spirit is capable of achieving more than what our hands can do. Altenmuller, E. (2005). Robert Schumann’s Focal Dystonia. Front Neurol Neurosci. Basel, Karger, 2005, vol 19, 1-10.